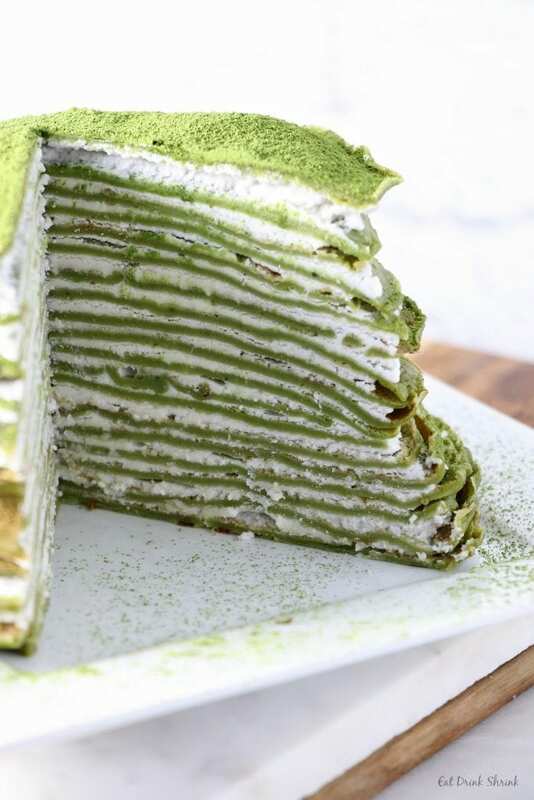 Vegan Matcha Crepe Cake - Eat. Drink. Shrink. Since I made this recipe roughly two weeks ago, all I’ve been thinking about is..
At first glance this concept seems very involved and meticulous in creating, but it’s all false. This concept is as easy as making plain ol’ crepes, you just need to make, well, a lot more! What I love about this concept is that it breaks away from the typical cake, is lighter, and has much more aesthetic appeal. 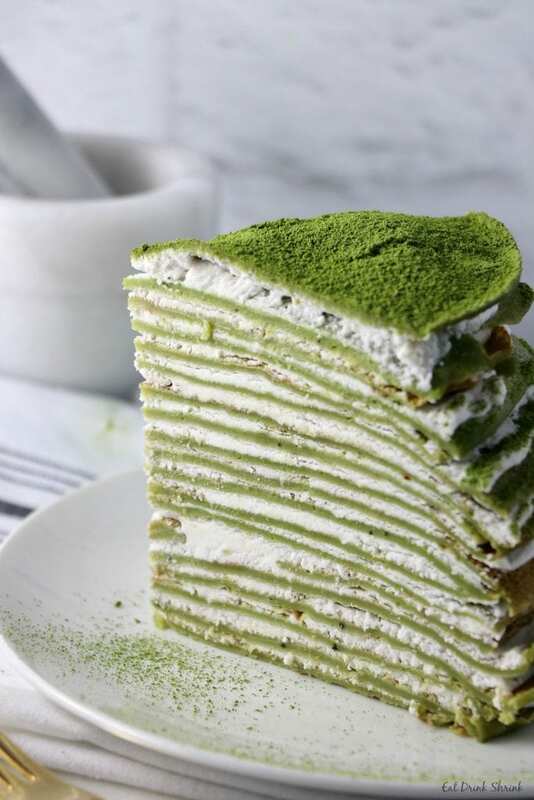 While I’ve explored a vegan Red Velvet Crepe Cake, this Matcha just calls to me! 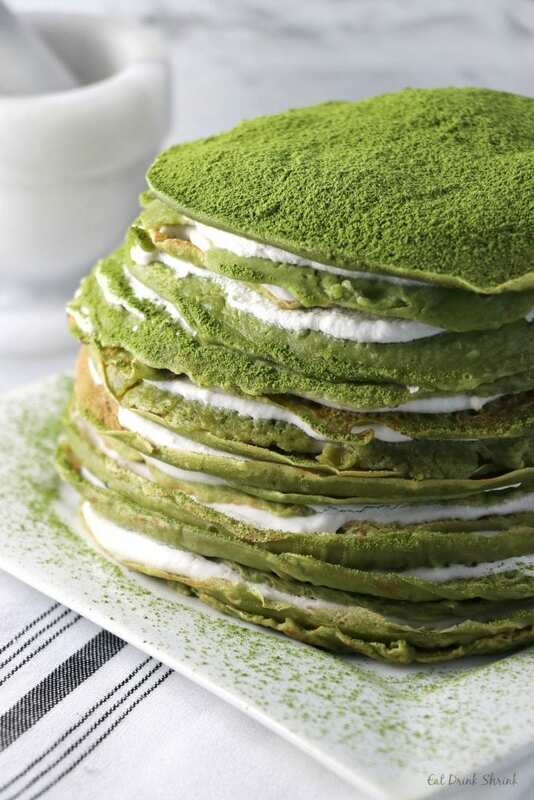 What sets this recipe apart from others is that it involves minimal ingredients, minimal steps, doesn’t have to look aesthetically perfect, has a gorgeous hue, a hint of matcha, and the coconut whip just puts this recipe over the top. 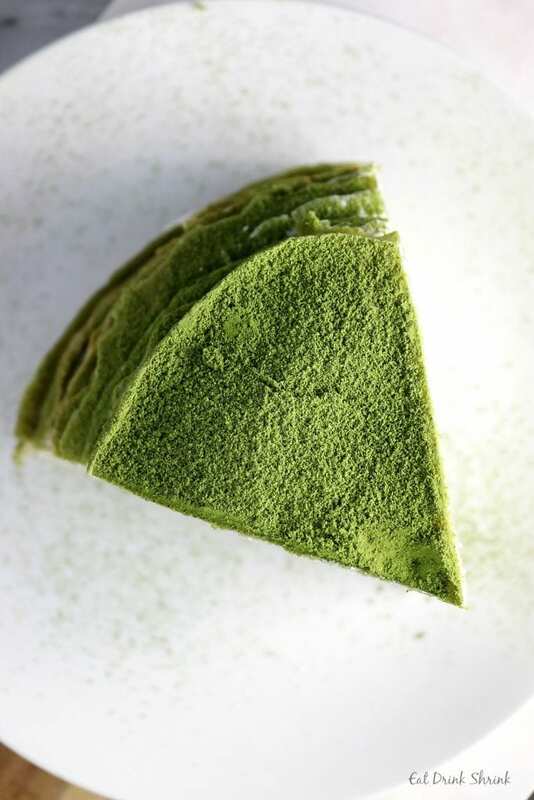 If I had to pick two recipes right now to eat for months, one would be the vegan Lemon & Rosemary Olive Oil Cake and the second would be this vegan Matcha Cake!! 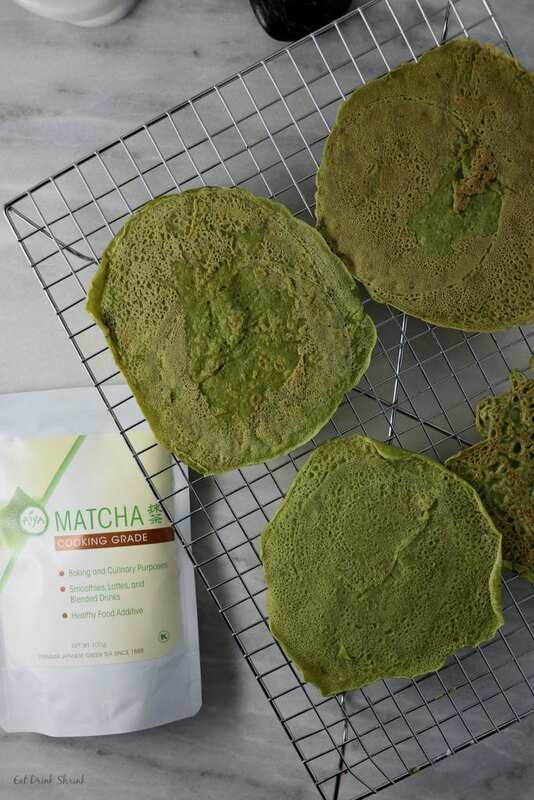 I also found that working with Aiya Matcha made this recipe seamless! 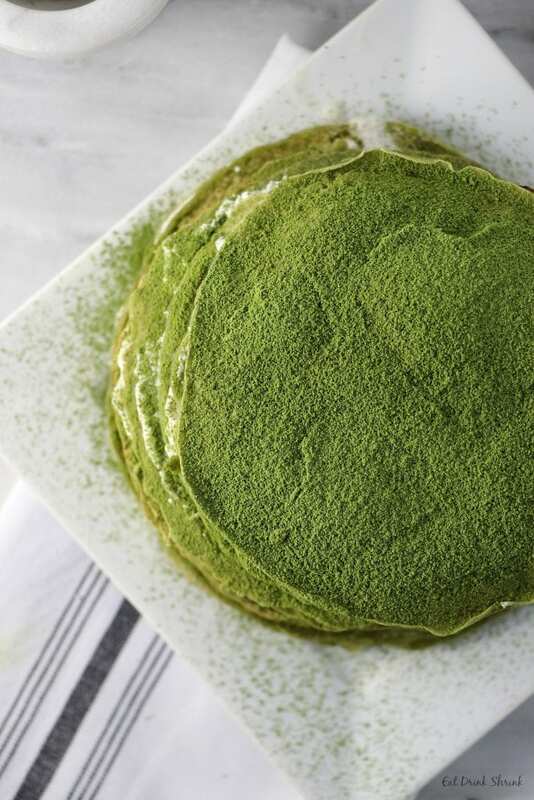 Its the perfect culinary grade matcha that can be used for a variety of concepts. If you need this staple in your kitchen, I highly recommend theirs! 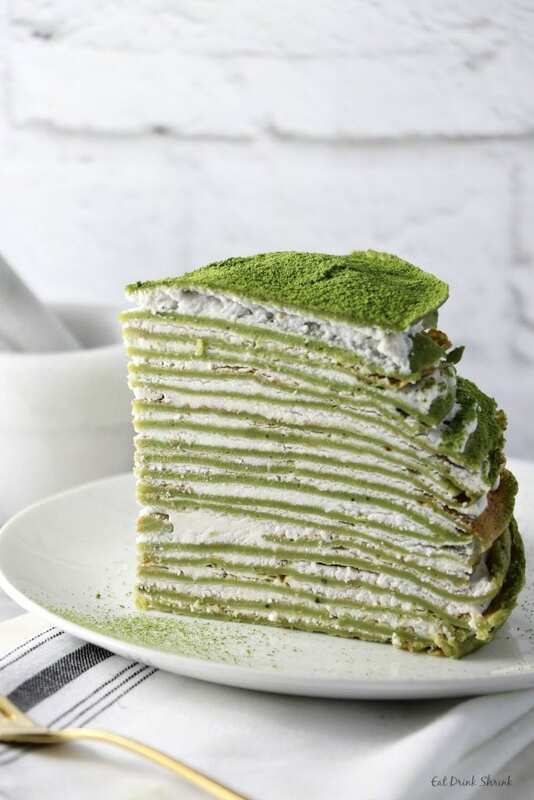 If you love crepes, matcha, or simply just fabulous vegan eats.. You have to try this vegan Matcha Crepe Cake with coconut cream! Don’t believe how easy it is? Coconut whip: Remove the solid portion of the canned coconut and place in the bowl of a standing mixer with vanilla. Sift in the the powdered sugar for the best texture. Combine until smooth without clumps and set aside to chill. Crepes: To make the crepes, combine all of the dry ingredients, add the almond milk and egg, and set aside in the fridge for about 20 minutes. Heat a crepe pan or medium size nonstick skillet to medium heat. Right before you are going to add batter, put a small dap of butter in the pan and swirl to coat. Then, using a ¼ cup scoop, scoop batter into the pan, swirling the pan as you pour to evenly coat the pan with the batter. Once the batter is even, set the pan down and allow the crepe to brown just slightly. Then carefully lift up the edges with a spatula and flip over. Once the crepe is browned on both sides, turn it out onto cooling rack. Repeat with remaining batter until all of it has been used. To assemble, lay out the crepes from largest to smallest if the sizes vary. 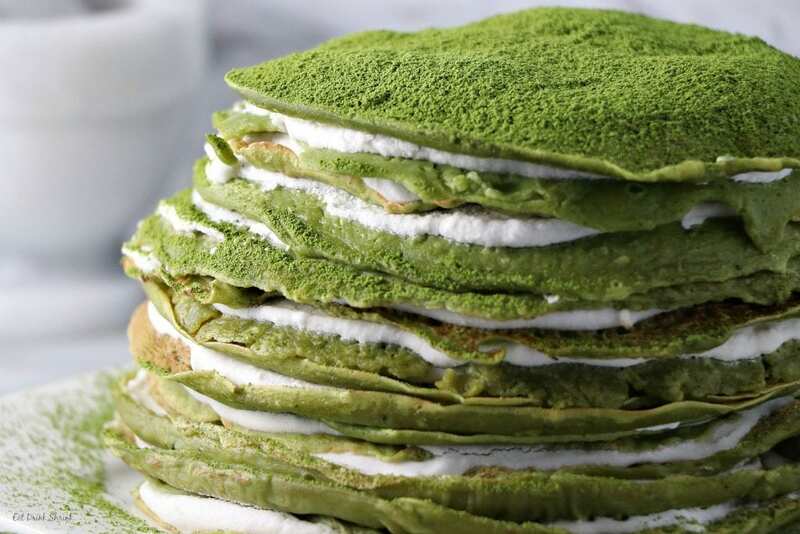 With a knife or spatula smooth on a layer of coconut whip and add the next crepe. Continue until you've used each crepe. 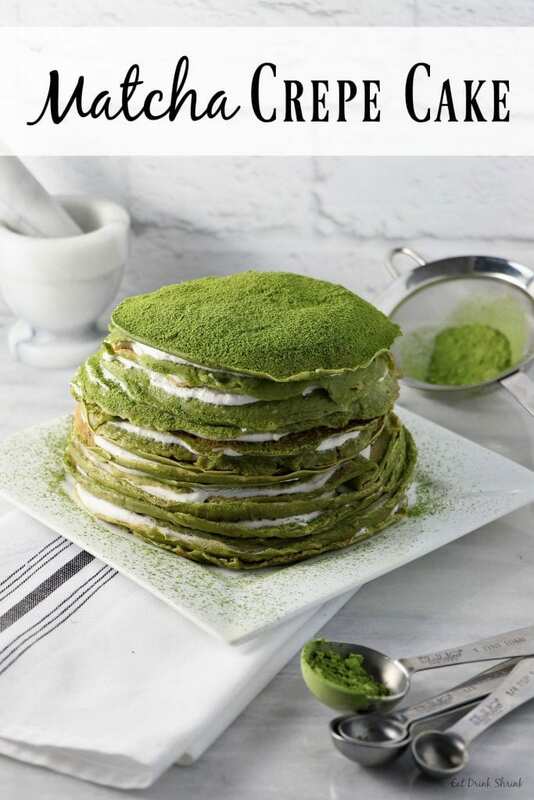 Gently sift matcha over the top to coat the cake leaving some on the sides for aesthetic appeal. Slice, serve, enjoy! hey so I'm new to baking but this looks amazing! And I love your BGM for the video as well! But I tried and didn't work out very well for me. I used coconut whip cream and put it in the fridge the night before but didn't freeze it. did you put it in the freezer? what brand did you use? mine has a milk like texture so I couldn't use it. Also, the crepes taste too... solid? I used all-purpose flour. Thanks for sharing! Yes! So the coconut whip has to be chilled in a fridge overnight or at least for a few hours. There are tons of companies that make coconut milk that won't work, it's trial and error. I always use Thai Kitchen Full Fat. For the crepes you want to make them as thin as possible, but being that there isn't real egg used, the texture may be potentially different. I hope that helps! I will try making it again some time ;) Thanks for sharing your recipe!